Sudhir Gautam, the most passionate fan of the Indian cricket team, is well known. He is perhaps the lone privileged fan who gets a call back from his idol, Sachin Ramesh Tendulkar. The Little Master even sponsors Gautam’s India match tickets. Gautam was even present in Team India’s dressing-room on the night of April 2, 2011 when India lifted the World Cup at Wankhede Stadium, Mumbai. Can it get any better? A fan enjoys so much attention from his icon. Today, Sudhir is an integral part of Indian cricket. Sudhir, in turn, does a lot more than featuring as Team India’s constant pillar of support. He paints the tricolour on his body, fasts the entire day and eats only when India emerges victorious. He even reached Bangladesh on his bicycle to back India in the 2011 World Cup opener. In addition, Sudhir also sends litchis to Tendulkar, MS Dhoni and Harbhajan Singh. Isn’t the man living every fan’s ultimate dream? What are fans to the game? Fans are the sole existence of a game. They light up stadiums with childlike celebrations. They are even regarded as the official 12th men. They won’t feature in the playing XI, but their participation off the field is paramount. Fans inject energy and help players overcome rough tides. They are the voice and shadow of players irrespective of their performances. There are plenty of fans. But how many of them have made an impact across the globe? Sudhir, Sri Lanka’s Percy Abeysekera and Pakistan’s Cricket-Chacha are three prominent names that come to mind. Can we think of anyone else? A supporter of a relatively-inexperienced side, maybe? Meet Adrian Raftery. Popularly known as Larry the leprechaun, this Irish-Australian is a professor of taxation in Australia, and an Irish cricket fan. His World Cup 2007 photographs had broken the internet, taking everyone by surprise. Sporting a fake beard, long hat and traditional Irish attire, Larry often appears dressed as a leprechaun. Well, he has plenty more to add. I got a chance to interact with him, picking his brain on what drew him towards the game to becoming a known face in the team dugout — all the while supporting a not-too-outstanding side. CricketCountry (CC): Larry the Leprechaun is considered a devotee of Ireland cricket. Can we assume you are the ‘official mascot’ for the national team? If not, would you want to be one through sponsorship? 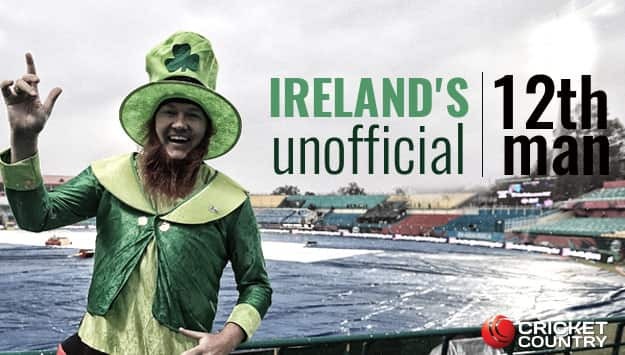 Larry the Leprechaun (LL): I am not the official mascot for Ireland — I don’t think there is one — but I like to be considered as Ireland’s unofficial 12th man. I do not score runs, take wickets or contribute in the field. However, I like to think that I have been able to rev up the Irish crowds, collectively help the 11 guys out in the middle grow an extra leg and perform beyond expectations. I am aware of my contemporary Superfans across the globe. Some of them do receive support in some shape or form. It will be nice if I did receive similar support as the cost of travelling globe has added up over the years, not to mention the amount of annual leave availed! CC: How did an Irish-Australian become so much inclined towards Ireland cricket? Also, did you ever aim to become a cricketer? LL: In 1971, my parents emigrated to Australia with no knowledge of cricket whatsoever. It was considered a ‘foreign’ or banned sport for those who played Gaelic Athletic Association (GAA). My father was a part of it. It was not until Kerry Packer and his World Series Cricket (WSC) stormed in the late 1970s that my parents started embracing cricket. At a time when there were only 4 TV stations in Australia — of which it was really hard to watch one (ABC) — there were WSC matches being televised virtually every alternate day on Channel Nine during summer. My father’s hero was Doug Walters while mom loved DK Lillee, Rodney Marsh and Max ‘Tangles’ Walker. My hero was Greg Chappell. My father had heard about the 1969 match when Ireland had rolled West Indies for 25. He used to joke that one ‘Bumper O’Farrell’ (a fictitious name as he didn’t have a clue) who got 6 wickets for next to nothing. I also remember visiting my grandparents in Galway, Ireland in 1980. I was a cricket devotee by then. It was, however, virtually impossible to keep a tab on the scores. While holidaying I would visit their English neighbour and ask them to read English newspapers to get updated on the scorecards from Australia – New Zealand Test series. By the time I went to high school in Sydney (Christian Brothers Lewisham), I was playing cricket for the school team. At 9 I even made it to the playing XI as a wicketkeeper-batsman. In my last year, a young Class 8 fellow, Jeremy Bray, made his debut. Jeremy, his brother Shaun, and I used to catch the train every day. I coached their weekend U- 14 team and even tutored their sister in Mathematics. I have three dreams. I wish Ireland emulates Sri Lanka from 1996 lifts a World Cup; I desperately want to see England thrashed by Ireland in a Test match; and I also want to see Ireland play in front of a crowd in excess of 80,000. 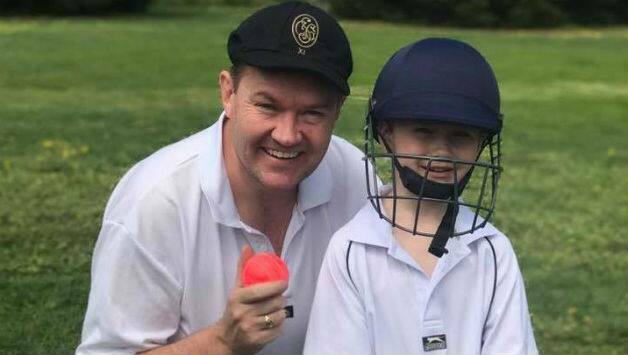 I watched Jeremy’s first grade cricket career in Sydney with interest, and was ecstatic when he was named the U-19 Australian cricketer of the year. In addition, he also represented a New South Wales (NSW) side alongside Mark Taylor, Michael Slater, the Waugh brothers and Michael Bevan. I was seeing an Irish girl in Portlaoise in the middle of Ireland. It was a farming area that played Gaelic Football and hurling. Definitely not what you would expect to be a traditional home of Irish cricket. In fact, I strongly recall her family telling me ‘there is no cricket in Ireland’ yet just two days later I drove past a cricket match in town called Togher. I called in and introduced myself. The first guy I met was a bloke called Roland. He later became a stalwart of Irish cricket and a selector of the Irish team. Roland said half jokingly, the last Australian to waltz into Togher used to played for NSW — a bloke called Jeremy Bray. Guess what, it was my old schoolmate! It turned out that Jeremy had himself fallen in love with an Irish girl while playing in Holland one winter and made a home for himself in Kilkenny. The internet had just kicked off at that point. I started to catch up with the Irish cricket scene, and Jeremy was dominating year in, year out with a thousand runs every season. By the time he lived in Ireland for 4 years he was selected for the Irish team. I was over the moon when he played in sides that defeated West Indies (again!) and Zimbabwe. I told Jeremy that if he made the World Cup, I will go and support him. At the end of school, I had to choose between cricket and Australian Football as my preferred sport. I opted for AFL given my physique as there are not too many 198-cm keepers in world cricket. World Cup 2007 was also our honeymoon: I married Kylie on March 11, 2007. The local media lapped it up. We had an absolute ball. Before Bob Woolmer’s death, Ireland was the story of that World Cup. It was an amazing time! 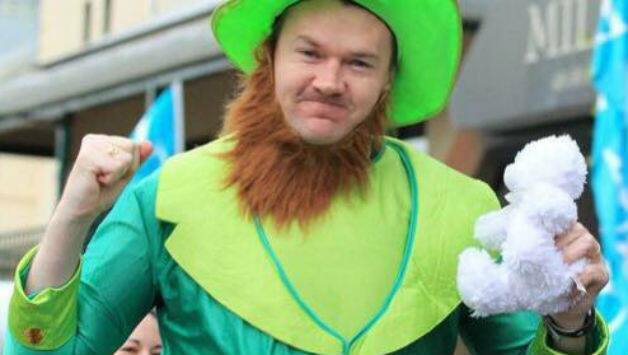 Larry Leprechaun hopes for Ireland to trounce England in a Test match. Photo Courtesy: Adrian Raftery Facebook Page. CC: Describe your most ultimate dream as an Irish fan. LL: I have three dreams. I wish Ireland emulates Sri Lanka from 1996 lifts a World Cup; I desperately want to see England thrashed by Ireland in a Test match; and I also want to see Ireland play in front of a crowd in excess of 80,000. CC: The cricketing world doesn’t know much about the state of cricketing affairs in Ireland. Comment on the level of acceptance towards the game there. Tell us from your experience. He had no idea until he saw my picture all over the media the following few days. He still chuckles about it. Over the past decade we have seen an influx of foreigners settle in Ireland. A high percentage of them play club cricket in traditional GAA strongholds such as Kerry and Galway. It is amazing! Cricket is far more accepted by the Irish public these days thanks to regular media reports. It continues to languish well behind GAA, rugby and soccer but it has gained respect. There is still some distance to cover for Cricket Ireland. On the other hand, ICC also has a role to play by promoting the game extensively. LL: Without a doubt. These matches are typically played either at the end of spring or at the beginning of autumn. Unfortunately, that is playing right into the hands of the Irish weather gods. Rashid Khan will rip through the current Australian top order: he is one of the world’s best spinners at the moment. His wrong ’un would be unplayable. The youngster is already a sensation in the IPL. Sadly he will largely be restricted to playing against Ireland and Zimbabwe. Another huge barrier is most international sides opting to play mid-week rather than on weekends; resulting in smaller crowds due to work. It also disappoints to see England not sending their core players, and doing very little to promote cricket in Irish schools by virtually flying in and out on visits. By all reports, Australia and Pakistan have been brilliant over the years in promoting the sport to the locals. Of course, the lack of matches does hurt the development of the main Irish team, let alone the next crop in the A team that gets minimal exposure against top sides. June is the ideal time to hosts matches but that is unlikely to happen in recent future. CC: In your view, how is the First-Class structure and ground conditions in Ireland? LL: I think First-Class cricket in Ireland has been doing pretty well since its two years of inception. Leinster Lightning are obviously dominating considering the history of sport in Dublin. That will change in five years time as the competition gradually improves. The grounds are lovely. Malahide is set in the middle of some amazing grounds around the castle. With time, permanent stands will be erected and it will be one of world cricket’s iconic grounds. CC: Ireland have produced some bright talents like William Porterfield, the O’Brien brothers and Ed Joyce. How significant are they in Ireland cricket? CC: Do you want to name any young cricketers? LL: Jack Tector and Joshua Little are the ones that come to mind. I am really keen to see how Ireland fares in the next Under-19 World Cup. I predict Andrew Balbirnie to be Ireland’s first Test centurion. He is most suited to take over the reins from Porterfield when the latter decides to end his inspiring tenure. CC: Ireland are no more an Associate Nation. They have grabbed the coveted Test status. What, in your view, is the significance of Tests in modern-era? LL: Test Cricket is dying. It badly needs an injection. Day-night Tests are a short-term fix in my belief as the novelty will fade. In Australia, only the first few days of the Boxing Day and New Year Tests attract strong crowds. I dare Cricket Australia to host Tests at MCG and SCG at other times of the year to witness a reality check. I would love to see an analysis of results over the past few decades but I reckon that there are more three- or four-day Tests than ever before — at a time when pitches are at their best comparatively. In the T20-dominated era, batsmen simply do not know how to grind out a hundred in tough conditions. When conditions are not favourable, batsmen fail to convert a big innings. The push to four-day Tests is a joke: give me a Test that is decided in the last session any day! One thing I would consider changing is the coin toss. Let the opposing team decide who bats or bowls first. The administrators simply needed to promote Afghanistan and Ireland. There needs to be more of it to grow markets that multinationals will be interested in pumping money into. The ageing of the current crop of Irish players means they have probably missed out on playing at their absolute peak. However, the current Afghan side is primed to cause a few upsets if given chance. I have my doubts whether top Test sides will bother playing Afghanistan or Ireland for a long time. It’s been a few months when they were announced as Test nations, yet where are the teams lining up to play them? Australia had snubbed New Zealand between 1947 and 1973. They had done the same to Bangladesh recently. On both occasions, the two countries scored amazing inaugural Test wins against the Baggy Greens. If given a chance, I reckon Rashid Khan will rip through the current Australian top order: he is one of the world’s best spinners at the moment. His wrong ’un would be unplayable. The youngster is already a sensation in the IPL. Sadly he will largely be restricted to playing against Ireland and Zimbabwe. CC: Most cherished and celebrated wins of Ireland? LL: The ones against West Indies (1969, 2005 and 2015 World Cup) are still fresh in mind. Defeating Pakistan in World Cup 2007 (no surprises there! ); being St Patricks Day it was the most celebrated from a drinking point of view. We had pre-arranged a big party that night in Ocho Rios on the other side of Jamaica. Let me tell you it was some party! The icing on the cake was the victory over England in World Cup 2011. Tthank you Kevvy (Kevin O’Brien)! I actually predicted that evening that Paul Stirling would get the fastest World Cup century — later in the tournament he got pretty close to the old record. So I wasn’t far! One against Zimbabwe in 2005 (by 10 wickets, when they were a reasonable side!). In 2007, the tie was also amazing. Lastly, against England in our inaugural Test, at Lord’s in 2019. That is, if they are brave enough to face us (chuckles)! CC: ICC has been contemplating on playing 50-over World Cups with top 10 teams. As a fan, what is your take? LL: It is hard to believe an organisation as myopic as the ICC. Every sport, from soccer to rugby to the Olympics, is trying to increase participation on the world stage. A 10-team World Cup is virtually a rebranded Champions Trophy. Reducing the number of sides is one of the dumbest decisions they ever made, and horrible for developing the sport. I would love to see Nepal playing in a World Cup — I reckon it would take the development of the game to another level. But sadly that will never happen. CC: How did you, as an Irish cricket fan, see the talent drain to England (for instance, Eoin Morgan). Do you believe that the Test status will put an end to this migration? LL: No doubt the migration will stop. That is the sole reason why players like Eoin went there. Of course, Eoin’s development is much attributed to the opportunities that ECB afforded him. However, I would love to see him wear the Shamrock cap in the near future. I think ICC need to be flexible to allow his return as well. CC: What can Ireland learn or emulate from England Cricket Board (ECB)? LL: I think Cricket Ireland would be mad to try to emulate ECB. Over years English cricket has largely been in shambles. Like all sports, I will be trying to follow the best in world cricket. At the moment, it is India. ECB, over the years, have done little favours to their Irish neighbours. CC: In your opinion, which Australian players would Ireland want to have in their ranks? LL: To be honest, only David Warner, Steven Smith, Mitchell Starc, Josh Hazlewood and Patrick Cummins (and they would probably make most World XIs too) — but there are always injury clouds hovering over the three bowlers. The rest of the current Aussie side is actually quite poor as their international records indicate. Both Gary Wilson and Niall O’Brien are better wicketkeepers than Matthew Wade. The Australian players got it so wrong in the recent pay dispute. It came as no surprise when Bangladesh beat them. I am expecting the English to wallop them this summer in The Ashes. They are a mere patch of the great side of a decade ago — Haydos [Matthew Hayden], Punter [Ricky Ponting], Gilly [Adam Gilchrist], Warnie [Shane Warne] and Pidge [Glenn McGrath] would demolish the current crop. David Warner is my favourite cricketer, as were Matthew Hayden, Adam Gilchrist and Greg Chappell. CC: How do you keep yourself motivated to Ireland, despite little success coming their way? In addition, do you look up to Australia cricket for consolation? LL: Since 2007, I have had the pleasure to meet the Irish players and their families as well as Cricket Ireland administration. They are friends. And you always support your mates no matter what. So the motivation is pretty simple. Larry Leprechaun (also, Adrian Raftery) poses with his son. Photo Courtesy: Adrian Raftery Facebook Page. I am obviously an Australian cricket fan as well. I love my cricket. In fact, Cricket Australia featured me and my son in an advertisement last year. They didn’t even know about Larry! In virtually all sports I am Australia Number One and Ireland Number Two. So I follow the Wallabies when they play Ireland in rugby or the Socceroos in soccer. But when the two play cricket, it is Ireland Number one. I have actually surprised a few of the Irish cricketers with that. I am a proud Irish-Australia: Australia has been magnificent to the Irish emigrants by providing an amazing lifestyle in the ‘lucky country’. I support three teams — Ireland, Australia and whoever plays England! Original article published here on Cricket Country on 3 October 2017.